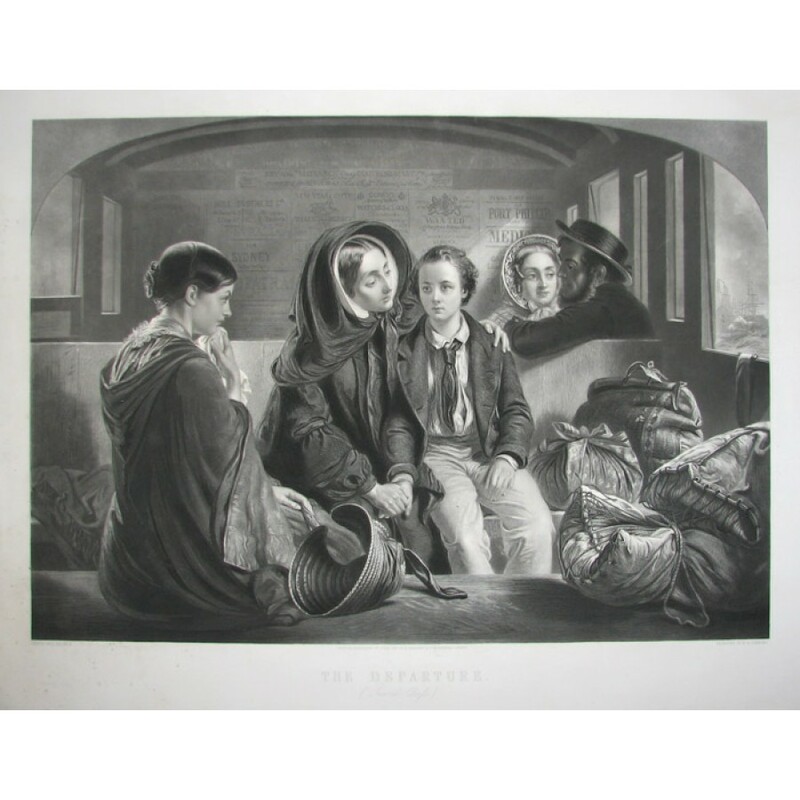 A pair of mixed method engravings published by Gambart and Co. in 1857 in a declared edition of 225 pairs. The original paintings were exhibited at the Royal Academy in 1854. 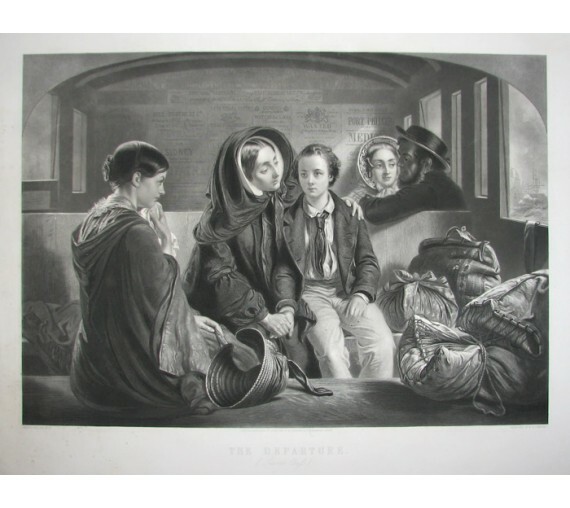 In the first picture, the scene is the interior of a second class railway carriage with hard, unpadded, wooden benches. A young mother, plainly dressed in a black coat, bonnet and shawl, clutches the hand of her young son, who is evidently on his way to Portsmouth to join the service of the East India Company (a recruiting poster is pasted to the wall above his head). 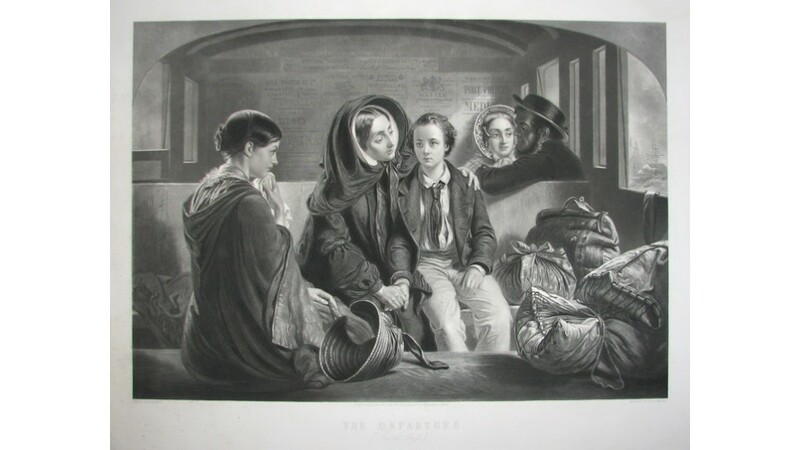 His tearful sister sits on the bench opposite next to her brother's baggage, a sailor is traveling with his wife in the background, numerous posters advertising ship passages to Australia and India, and other advertisements are stuck to the walls, and ships in the harbour are visible through the carriage window. In the second picture, the young man (now considerably older), has returned to England, evidently having made his fortune. 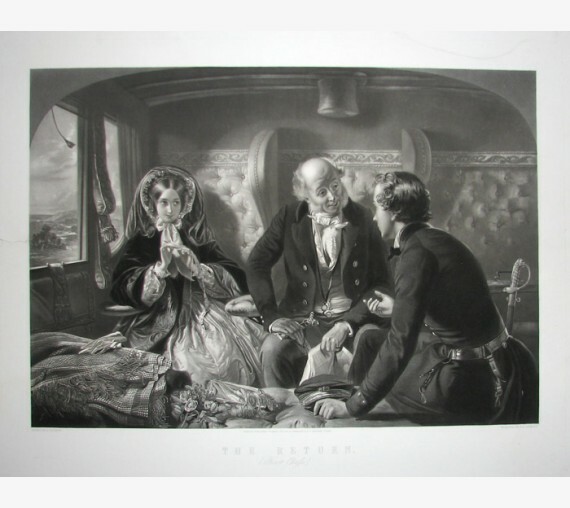 He sits in backview, in a comfortably upholstered first class carriage, wearing smart military uniform, chatting to an elderly, well dressed fellow passenger, while exchanging glances with the old man's pretty, fashionably dressed young daughter, who sits demurely crocheting in a corner of the carriage. Abraham Solomon was a popular London artist and Simmons was a notable mezzotint engraver. The Departure has some faint spotting lower right corner in margin, faint indentation in title area and repaired tear in margin outside the platemark on right hand side. The Return has a repaired tear on left hand side which enters the image about 4cm. It also has a repaired tear in top margin outside image area but within platemark.